SNAP can publish nicely formatted messages to your Facebook, Twitter, Google+(Google Plus), Blogger, LiveJournal, Delicious, Diigo, Stumbleupon, LinkedIn, Pinterest, Plurk, VKontakte(VK.com), WordPress, and Tumblr accounts. You can reach the most audience and let all your friends, readers and followers about your new post automatically. Plugin works with profiles, business pages, community pages, groups, etc. Plugin makes 100% White Labeled Posts. The main idea behind the plugin is to give you the ability to promote only yourself. Plugin uses your own apps and all posts to all networks come only from you. No “Shared via NextScripts.com” or “Posted by SNAP for WordPress” messages. Deviantart.com -Autopost to your blog. HTML is supported. Evernote/postach.io [New] – Auto-post to your Evernote account or postach.io Blog. Flickr [New] – Autopost to your photostream and/or sets. Tags are supported. Google+ (with third party API library) – Autopost to your profile or business page. Ability to attach your blogpost to Google+ post. Ability to make “Image” posts. LiveJournal – Auto-submit your blogpost to LiveJournal. Medium – Auto-submit your blogpost to Medium profile or publication. Scoop.It [New] – Autopost to your “Topics”. Ability to attach your blogpost to scoop. Ability to make “Image” posts..
vKontakte(ВКонтакте)(VK.com) – Autopost to your profile or group page. 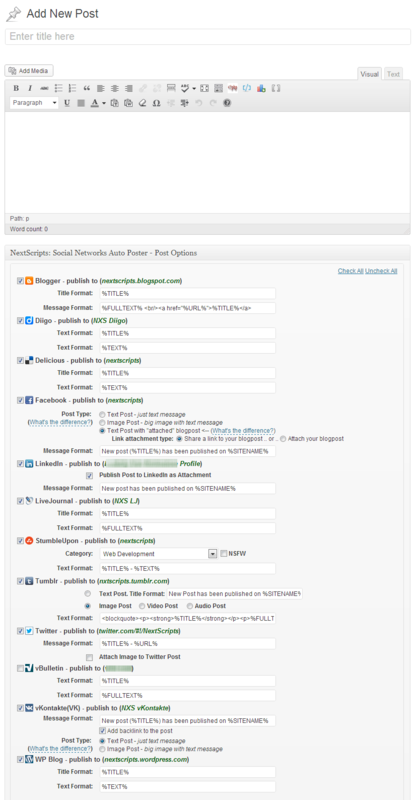 Ability to attach your blogpost to vKontaktepost. Ability to make “Image” posts. YouTube – (with third party API library) – Post messages to your YouTube channel feed. If blogpost has youtube reference it will be attached. * (with third party API library) means that you need to have at least “Run-Time Edition” of SNAP Universal API. SNAP API Run-Time Edition is included in the SNAP Pro Plugin. PHP should have at least 64M of memory (128M and more is highly recommended). Have problems? Please check out the Troubleshooting FAQ page. * New - Ability to use "Custom Fields" %CF-CustomFieldName% in autoposter message templates. * New - New template tag %ANNOUNCE% Inserts the text till the <!--more--> tag or first N words of the post. * New - Ability to "Spin" message post templates. * New - Support for YOURLS URL Shortener. * New - Support for goo.gl URL Shortener. * Improvement - All "Message Format" fields are now multirow fields. * Improvement/Bug Fix - additional protection against magic quotes. * Bug fix - Stumbleupon category selection. * Bug fix - Twitter characters limit when %TEXT% is used. * Bug fix - Autoposting stability improvements. * Bug fix - Featured image location in custom field. * Bug fix - International characters for Blogger (Free API). * Improvement/Bug fix - Twitter - Better hashtags support. * Bug fix - Previously shedulled posts were not autoposted. * Bug fix - VK - Open community autoposting fixed. * Bug fix - LinkedIn - Immideate Posting problems fixed. * New - New network "Instapaper"
* New - Livejournal and DreamWidth - autoposting to communities and shared blogs. * Bug fix - LinkedIN SHARE errorfixed. * Bug fix - StumbleUpon wrong category selection fix. * Bug fix - Delicious better error handling. * Bug fix - Facebook better error handling. * Bug fix - Twitter text post fix. * Bug fix - Critical bugfix for Facebook Authorization. * Bug fix - "Import comments" interface tweaks. * Bug fix - "Add new network" interface tweaks. * New/Improvement - Plugin will invoke it's own cron in case of broken WP Cron. * Bug fix - vKontakte - NXS API Fixed. * Bug fix - Pinterest - fixed "board retreive" that could break the settings. * Bug fix - Pinterest - fixed "0" board ID problem. * Bug fix - Pinterest - fixed problem with wrong default image. * Bug fix - Plurk - Better error handling. * Bug fix - Fixed broken posting to selected categories only. * Bug fix - Account assigned categories were not saved. * New - New network: VKontakte(vk.com). Repost your blogposts to your VK account. * Bug fix - WPMU Edition only. - Lost settings opages on users websites. * New - Support for posting to Google+ Communities. * New - Auto-posting is now supported for WordPress pages as well. * Bug fix - Twitter over the limit if a lot of tags were used. * Bug fix - Blogger posted the wrong title. * Bug fix - Critical Facebook posting issue. * Bug fix - Critical Stumbleupon posting issue. * Bug fix - Post/Don't Post checkboxes issues. * Bug fix - Twitter - incomatibility with url_f_open set to off. * New - New network: LiveJournal. Repost your blogposts to your LiveJournal account. * Improvement/Bug fix - Facebook - better handling of videos in the post. * New/Improvement - Direct links to posts in the "Edit" page. * New/Improvement - Pinterest - ability to "Pin" videos. * Improvement - if post has video and no images, video preview image wil be used. * Improvement/Bug fix - Fixed incorrect image checking against websites blocking HEAD request. * Improvement/Bug fix - support for "attached" but not "featured" images. * Bug fix - Facebook were getting a broken "image" post if post contained a video. * New/Improvement - external jQuery reference removed. * Bug fix - Pinterest board selection fix. * Bug fix - StumbleUpon connection fix. * Bug fix - Twitter %TAGS% and %CATS% were not found in the text sometimes. * Bug fix - WordPress better handling of connection errors. * Bug fix - Post status saving. * New/Improvement - Ability to change format before reposting when you edit post. * Bug fix - Critical Blogger "Function not found" fix. * Bug fix - Escaped quotes in Message Format. * Improvement/Bug fix - Better image handling. * Bug fix - Broken URL Shortener Selection. * Bug fix - Fixed LinkedIn for European accounts. * Bug fix - Twitter Message length tweaks. * Improvement/Bug fix - Google+ better "Post type" selection. * Bug fix - Google+ - image uploads for pages go to the right album, not profile. * Improvement - Twitter - If tags and categories are already in the text will become hashtags, not duplicates. * Improvement/Bug fix - "Check All/Uncheck All" links now have priority over category selection. * Bug fix - Blogger - broken messages. * Bug fix - Plurk - 180 characters limit. * Bug fix - Twitter correct characters count (119) for "Posts with image"
* Improvement/Bug fix - Facebook - better image posting. * Bug fix - Blogger taking over the WP Admin after the error. * Bug fix - Plurk Error "Call to undefined function http_build_url()"
* Bug fix - LinkedIn "We were unable to post your update" error. * Bug fix - Pinterest UTF characters in the Board names. * Bug fix - Pinterest - better Handling of Error 502. * New - New network: Plurk. share your new blogpost on your Plurk account. * Improvement - Facebook settings screen shows what URL and Domain use for App Configuration. will add a line break for "Facebook Message text Format"
* Improvement - "Click-through URL" for the Tumblr "Photo" posts can use shorthened URLs. * Improvement - Ability to select custom field instead of the featured image. * New - Facebook "Photo" posts. * New - Bit.ly support for short link. * Improvement - "Click-through URL" for the Tumblr "Photo" posts. * Improvement/Bug fix - Blogger Better support for broken HTML. * Bug fix - StumbleUpon debug info removed. * Bug fix - "Re-Post" buttons were not working sometimes. * Bug fix - Pinterest "Board Not set Error"
* Bug fix - StumbleUpon "Uncategorized" problem. * Bug fix - StumbleUpon "NSFW" problem. * Bug fix - Delayed posts "Hours" settings wasn't saved properly sometimes. * Improvement/Bug fix - qTranslate users - only default language will be auto-posted, not all of them at once. * Improvement/Bug fix - Better image finder. * Improvement/Bug fix - Better duplicate posts prevention. * Bug fix - Google+ - quotes in title might break the posting. * Bug fix - Google+ - broken switch between post types in "new post" page. * Bug fix - Better Tumblr Error handling. * Bug fix - Better Delicious Error handling. * Improvement/Bug fix - Blogger - UTF-8 Characters support (Russian, Greek, etc). * Bug fix - multiple slashes in "message format" field. * Bug fix - Blogger - Better errors handling. * Improvement/Bug fix - Compatibility mode is on bu default and the name for it changed to "Use Advanced image finder". 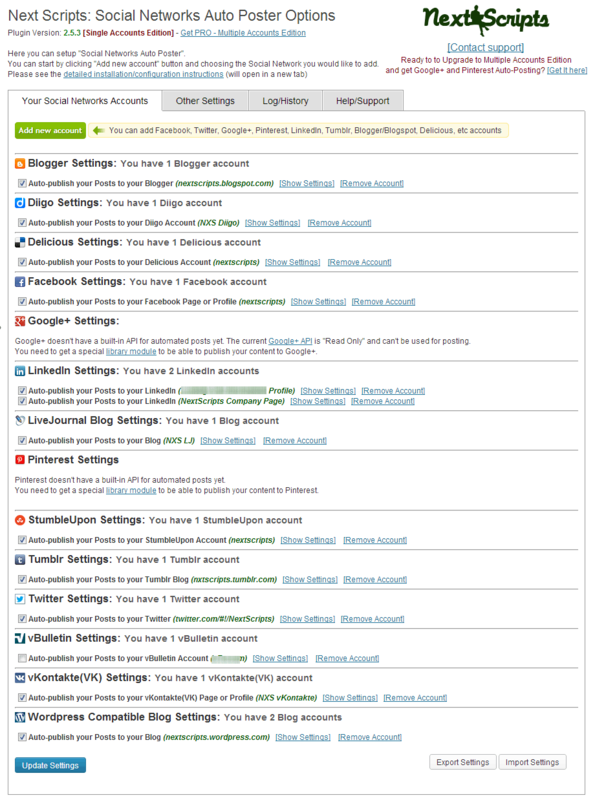 * Bug fix - Tags settings for StumbleUpon and vBulletin. * Bug fix - UTF 8 Special characters. * Improvement/Bug fix - Compatibility mode. Activate it in Plugin Settings->Other Settings if your site is having problems displaying content or giving you "ob_start() [ref.outcontrol]: Cannot use output buffering in output buffering display handlers" errors. * New - Google+ new post option - image post. * New - Delayed postings (Pro only). * Improvement - Google+ API is able to post images. * Improvement/Bug fix - if your site has og:tags from another plugin, ours are automatically disabled. This will prevent double titles in Google+. * Improvement/Bug fix - compatibility with several other popular plugins like Jetpack, bbPress, etc. * Bug fix - Blogger - tags length fix. * Improvement - Completely redone og:tags. Now compatible with SEO Optimizations from Plugins and Themes. * New - New network: Diigo. Share your new blogpost on your Diigo account. * Improvement - "No Categories Selected" warning. * Bug fix - Special characters in passwords fix. * Bug fix - Delicious Error Reporting fix. * Bug fix - Better Facebook SSL Error Handling. * New - New network: vBulletin. Share your new blogpost to vBulletin based forums. * Functionality Change - due to massive amount of requests - WP Pro (not WP Pro for MU) allows to post only to one main Super Admin account, not to all accounts across in the network. * Bug fix - StumbleUpon re-post wrong category fix. * Bug fix - "expecting T_FUNCTION" error. * Bug fix - Facebook stability. * Bug fix - WP Multisite Management problems. * New - New network: Stumbleupon. Share your new blogpost on your StumbleUpon account. * Improvement - Better configuration screens. * Bug fix - Facebook authorization problems. * Bug fix - Blogger Character encoding. * Bug fix - LinkedIn post without attachment. * Bug fix - Facebook Formatting problems. * Bug fix - Blogger Connections. * New - Installation/Configuration links. * Bug fix - Pinterest posting problems. * Bug fix - Delicious Login problems. * Bug fix - LinkedIn Company Pages posting improvements. * Bug fix - Facebook re-posting without attached post problems. * Bug fix - Blogger - "These characters are not allowed in a post label" error. * Bug fix - Another try to work around Chrome bugs adding multiple Blogger accounts. * New - New Tab - Help/Support with some useful info. * Bug fix - Important performance fix. * Bug fix - Log/History Refresh and Clear Buttons. * Improvement - Some interface improvements. * Bug fix - Important performance and stability fix. * Bug fix - Problem with disappearing accounts. * New - Admin can decide what user level can see the SNAP Meta Box on the "New Post" page. * Bug fix - LinkedIn was still attaching a post if not selected. * Bug fix - Problem with Log/History saving. * New - NextScript LinkeIn API support for company pages auto-posting (Beta). * New - Actions Log - see the log of the auto-postings. * Improvement - Better interface. * Bug fix - "headers already sent by line 344" Error. * Bug fix - Workaround fix for non-numeric "Facebook Group" pages. We hope that Facebook will fix it soon. * Bug fix - Saving problems for the "Settings" page. * Bug fix - LinkedIn post Formatting problems. * Bug fix - Facebook was still attaching a post if not selected. * Improvement - Include/Exclude categories are now a select/unselect inteface, not a field for entering numbers. * Improvement - Better Facebook attachement images handling. * Improvement/Bug fix - Detection of the Select Google Analytics for WordPress plugin that causes authorization troubles. * Bug fix - Twitter was missing URL if Title is too long. * Bug fix - 404 Errors during reactivation. * Bug fix - Message for Multiuser WordPress. * Bug fix - Tumblr Authorization problems. * Bug fix - Unselected Networks were still published. * Bug fix - Broken quotes in the "Message Format". * Bug fix - "Post Immediately" was broken for free accounts. * New - New network: WordPress based websites. This option includes WordPress.com, Blog.com, and and any other blogs based on WP. * Improvement - nicknames for your accounts. You can give each account a nickname to make it easier to identify in the list. * Improvement - better looking settings pages. * Improvement - new option to either schedule auto-posts (recommended) or do it immediately. This could be useful to the people with disabled or broken WP Cron. * Critical Stability fix - The next GoDaddy crush should not break your website. * Bug fix - disappearing accounts. * Bug fix - custom post settings weren't saved in some cases. * Bug fix - format and settings fixes for almost all networks. * Bug fix - Some Facebook connectivity issues. * Bug fix - Unselected Custom post types were still published in some cases. * Bug fix - Compatibility issue with some browsers. * Bug fix - Facebook "Share link" fix. * Improvement/Bug fix - some interface cosmetic changes. * Bug fix - Facebook Authorization "Error 100" Fix. * Improvement - Better list of available accounts. * Bug fix - Google+ Wrong options when using "Repost Button"
* Bug fix - Google+ Fixed publishing of new lines in messages. * Bug fix - "Facebok Options Save" error fix. * Bug fix - Delicious broken tags error. * Bug fix - Pinterest "Cannot access empty property" error. * Improvement - Pinterest is caching login info to prevent "multiple logins" issues. * Initial public 2.0 Release. * Bug fix - Tumblr Authorization issue. * New - Version 2.0.3 Beta is available to try. * Bug fix - Removed many (\\\) Slashes from some Google+ Posts. * Bug fix - Tumblr Authorization fix. * Bug fix -  New LinkedIn oAuth model support fix. * Bug fix -  Twitter New "Smarter" Twitter 140 characters limit handling fix. * Bug fix - Google+ Fix for new interfaces. * Improvement/Bug fix - New "Smarter" Twitter 140 characters limit handling. URL won't be cut anymore. * Improvement/Bug fix - New LinkedIn oAuth model support. * Bug fix - Google incorrect page issue. * Bug fix - Facebook Personal Page Authorization Issue. * Bug fix - SSL connectivity issued for some hosts. * Bug fix - Tumblr, LinkedIn and Blogger compatibility issues..
* Bug fix - Missing "No custom posts" option. * Improvement - Ability to Include/Exclude "Custom Post Types" from autoposting. * Improvement - Better "Custom Post Types" support. * Bug fix - Blooger Encoding issues. * Improvement - Security for Google+, Pinterest, Blogger - passwords are better encoded in the DB. * Improvement - Tumblr - Better compatibility with other plugins. * Bug fix - Twitter URL length fix. * Bug fix - Google+, Pinterest, Blogger - Incorrect Username/Problem due to the magic quotes being "On"
* Bug fix - More then 10 stability, compatibility, security fixes. * Bug fix - Tumblr/Blogger issue with missing function. * New - If blogpost has video it can be used as attachment in Facebook post. * Bug fix - Facebook %TEXT% and %FULLTEXT% formatiing issues. * Bug fix - Some Blogger Authorization issues. * New/Improvement - Tumblr is now open_basedir safe. * Bug fix - G+ Authorization problem with non google.com domains (like google.com.sg, google.com.br, google.ru, etc). * Improvement - better compatibility with some other popular plugins. * Bug fix - Tumblr Authorization Problem. * Bug fix - Several small bugs and formating fixes. * Improvement - Better handling of Twitter's "140 characters limit"
* Bug fix - Some Facebook Authorization/Connection issues. * New/Improvement - %AUTHORNAME% - Inserts the author's name. * Bug fix - Facebook 1000 character limit error fixed. * Bug fix - Repost button fixed. * New - Support for WordPress "Custom Post Types". * New - Ability to add open graph tags withiout third party plugins. * Improvement - Bettter compartibility/faster Google+ posting. * Improvement - If post thumbnail (featured image) is not set, script will look for images in the post. * Improvement - If excerpt is not set, script will auto-generate it. * Bug fix - Fixed "Changing format of the message for each individual post" problem. * Bug fix - Fixed missing "Pending-to-Publish" status change. * Bug fix - Twitter settings page format fixed. * Bug fix - Fix for "Cannot modify header information" message while posting to Twitter. * Improvement - New posting format: %TEXT% - Inserts the excerpt of your post. %FULLTEXT% - Inserts the body(text) of your post. * Bug fix - Activation Problem "unexpected $end" for servers with no support for short php tags. * Improvement - New improved settings page with test buttons. * Bug fix - Rare Facebook crush. * Bug fix - G+ Stability Fix. * Improvement/Bug fix - Fixed compatibility with another plugins using the same Facebook and Twitter APIs. * Bug fix - G+ problem with WordPress installed on Windows Servers. * Bug fix - Problem with Facebook and empty Website title. * Improvement - Updated Facebook posting - support for Facebook Groups, faster profile posting. * Improvement - Better compatibility with older WP versions (<3.1). * Improvement - Not requred to replace G+ library with each update if placed into /wp-content/plugins/ folder. * Bug fix - Wrong Options Page Placement. * Improvement - Better G+ Attachments Handling. * Bug fix - Included/Excluded Categories. * Improvement - Easier Facebook setup. * Bug fix - Wrong Re-Post Buttons. * Improvement - Better G+ Compatibility. * Bug fix - Correct Message after the post. * Bug fixes - default checkboxes. Contact us if you have any problems or if you need us to integrate script with your system or to expand the script in any way.